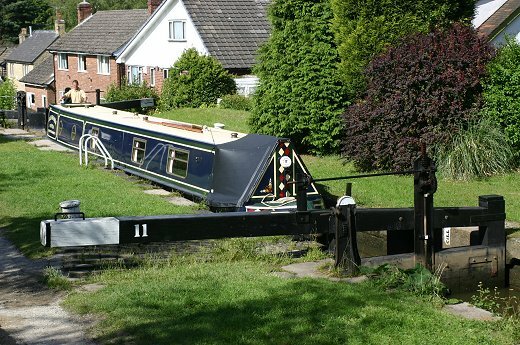 Between Lock 10 and Lock 12 the canal runs alongside the grounds of Marple Memorial Park. 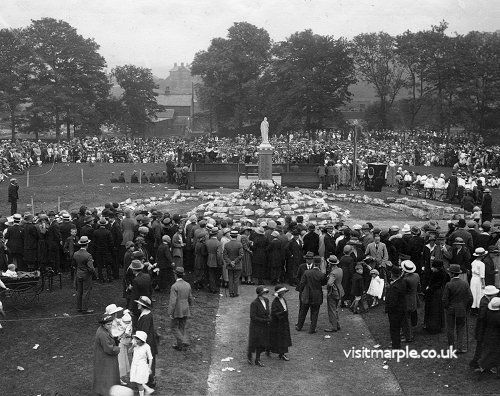 Memorial Park was gifted to the people of Marple by the Carver family, who owned Hollins Mill, as a memorial to the 141 Marple men who died in the First World War. The laying-out was done by public subscription and the memorial itself was originally dedicated on 22 July 1922. It was extended again after WWII, during which 50 more local men lost their lives. The park has its own Friends of Marple Memorial Park Group, whose first task day in 2004 involved removing brambles from the wall that separates the towpath from the park between Lock 11 and Lock 10 and erecting a fence alongside the sluice that carries the overflow past Lock 10. Modern day images - Mark Whittaker.